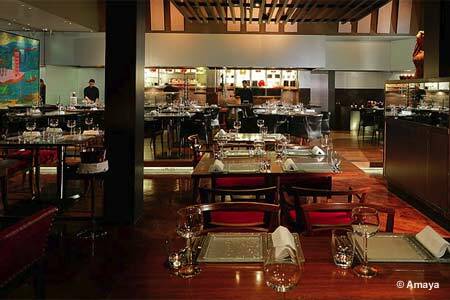 : The owners of this swank venue are no newcomers to the restaurant business, having made a success of their other ventures, Chutney Mary, Veeraswamy and the small Masala Zone group. But Amaya is the flagship. It’s a sophisticated restaurant that manages to be fashionable and comfortable at the same time. The room looks luxurious and stylish with rosewood and red panels, Indian interiors and glass, terra cotta sculptures from Bengal and Italian leather chairs. Food comes from the large open-plan kitchen, where three main grilling methods are stylishly executed: the tandoor, the sigri (cooking over a coal flame) and the tawa (griddling on a hot, thick iron plate). Ingredients range widely, from open flash-grilled scallops to tandoori duck. The menu has about 45 dishes ranging from seafood and fish to game, lamb and poultry with around 15 vegetarian dishes. There are main courses of curries and biryanis, but the idea is to share. The bar serves terrific cocktails and the service is friendly and professional. Set lunches are £22.50 during the week and £28 on weekends. In the evenings, a tasting menu of 7 items plus naan and dessert comes in at £60 per person, £85 with wine pairing. The vegetarian tasting menu is £40 for 8 items and dessert; 10 courses and dessert from the Chef’s Gourmet Menu is £80 per person, £115 with wine pairings.